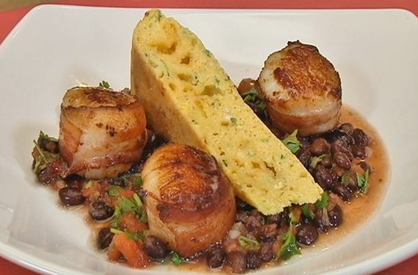 In honor of National Fried Scallops Day, today I'll be pairing pan seared bacon wrapped sea scallops with store bought fresh tomato salsa, which I'm tossing with some canned black beans and fresh cilantro, and then serving everything with homemade sliced cornbread. I'm using a homemade fresh corn and zucchini cornbread but you could use a regular box mix if you like. You need to make the cornbread ahead of time. You could make homemade tomato salsa if you want, but I'm just going to combine a bit of the fresh store bought tomato salsa with a handful of well drained canned black beans and a generous handful of chopped fresh cilantro. I'm using large sea scallops today, about 15 - 16 count per pound, and I'm using sliced regular cut bacon to wrap the scallops, but I'll only need about 1/2 slice per scallop. Wrap each scallop around the circumference with 1/2 slice of bacon and secure the loose end by placing a wooden toothpick through the scallop. Next, heat a large, dry, nonstick pan on medium to medium high heat and add the scallops bacon side down. Slowly cook those all around on the bacon side, crisping the bacon and then finish cooking the scallops to your liking on the flat sides. You can warm the sliced cornbread up if you like and place a slice of that over the top of some of the black bean and tomato salsa and, once the scallops are cooked to your liking, remove the toothpicks and it's time to eat.